Paint color - What is the paint on the wall and on the island? How do I get the wall paint color code? I am in Indiana & do not have access to a Hirshfield's. what color is the ceiling painted? I'd also love to know! Glass Cabinet Dimensions - Can you please tell me how wide the glass cabinet sitting on top of the counter is? We love the color of the Island. What color / brand? How wide are the book shelves on either side of the oven? Cabinet color and flooring - What is the color of the cabinets and what is the flooring brand and color? Details on the island posts please-Dimensions? Where were they bought? 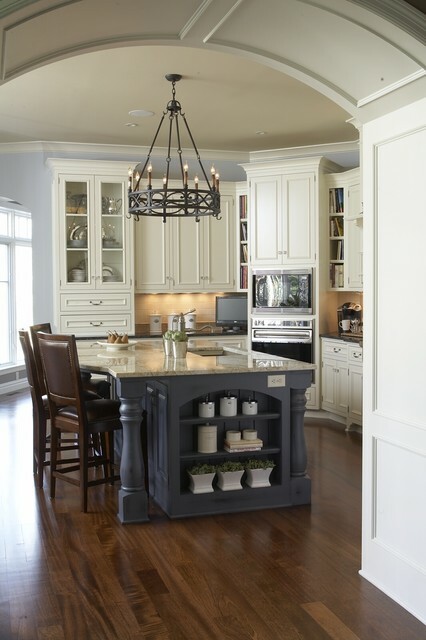 Roughly how much did the cabinetry cost with island? Island - Gorgeous island! Where can I order this from? If we do floors dark like this, the granite needs some dark pieces in it.